Did you know that we rely on one of the most Wild and Wacky Jobs every single day? Almost everything we use on a daily basis, the toaster, the dishwasher, the lights, runs off of electricity. But have you ever stopped to think about how that electricity got there? We all know power is generated at a power plant and it travels through power lines to your house. But who maintains those miles of power lines? And what about lines through mountains, over forests, or even under the sea? Let’s find out. A Lineman is the proper title for a tradesman who maintains power lines. You have probably seen them before, they wear bright orange vests and wear white helmets. Cherry-picker trucks with a long, extendable boom hoist these workers up to the lines so they can be repaired. In linesman speak, this is the easy job. The hard job is when there is no road to reach the lines, no truck to drive them there, no boom to lift them. How then can they repair the power lines? This job is reserved for the most daring linemen in the industry, affectionately known as Copters. These brave men travel via helicopter to broken power lines in remote and inaccessible areas. Copters work in two or three-man teams. One man pilots the helicopter, trying to keep as still as possible so the other one or two can repair the lines. The most amazing part, however, may be the method these linemen use to get to the lines. Each of these special helicopters is installed with an electrically-bonding platform on top of the copter’s legs. The repair men sit on these platforms to do their repair work. 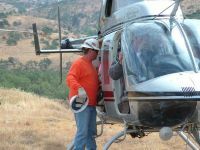 The second option in reaching the lines is for the lineman to wear a harness and be lowered out of the helicopter by a special rope. Crazy, no? Although it is very daring, the job at first may seem relatively simple. It’s not. You see, the power lines are still conducting electricity as the linemen are working on them. That means 110,000 Volts of electricity are moving just inches from these tradesmen. That kind of energy could fry them like an egg! So how do they protect themselves? The first step is to protect the helicopter. Because the helicopter is made of metal, usually aluminum, it will conduct electricity if there is a potential difference between it and the lines. The helicopter pilot avoids this in two ways. First, he steers the helicopter far enough away from the lines that the current can not jump through the air. Secondly, the pilot, along with the lineman, will attempt to neutralize the potential difference between the two, further limiting the chance of a current jump. The lineman, however, has to get up close to the power lines, putting himself at risk of electrocution. He is so close that, instead of trying to avoid the current jumping onto his body, designers of his safety suit chose instead to encourage the electricity to conduct. His special garment, called a Faraday suit, is made of tiny, conducting wires interwoven in an insulated fabric. 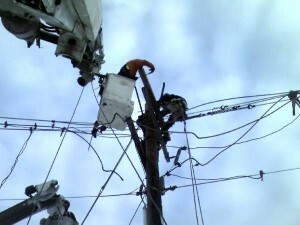 These wires direct electricity around the lineman, while the inner, plastic layer insulates his body. So, in a way, when a lineman is working on power lines, he actually becomes a part of the power grid, conducting electricity through his suit!